With more than 1 billion daily users, Facebook is still one of the top digital platforms for savvy advertisers. However, running successful and profitable campaigns on Facebook isn’t as simple as logging in and taking advantage of the social network’s enormous userbase. Advertisers have to tailor their messaging to Facebook’s various ad formats in order to reach those users. 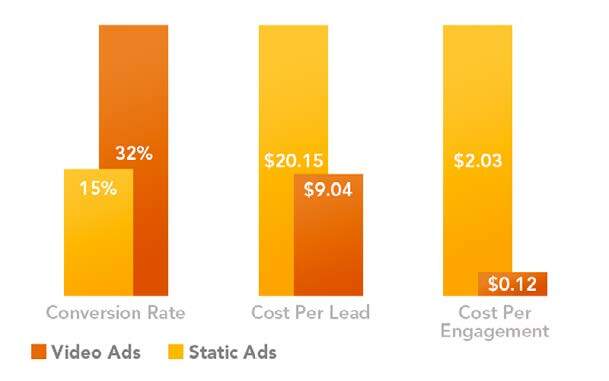 We tested this by comparing static ads vs. video ads with one of our direct-response advertisers who measures performance on a cost-per-lead (CPL) basis. For advertisers like this one, who have a more complex product or message, video is the Holy Grail. It allows viewers to easily consume and respond to a strong call-to-action in a 30- to 60-second time span. To test this assumption — that video’s entertainment value can deliver a more complex message and spur more users to convert — we compared the two ad formats over a 30-day time period. Video ads outperformed static by more than double, driving up conversions while decreasing CPL by 55 percent. Just by switching to video, this client was able to produce twice the conversions with less ad spend. Cost-per-click was roughly the same between the two ad formats as roughly the same percentage of users clicked through from the ad. Instead, the conversion rate more than doubled from static ads to video. With video, viewers spent more time consuming the ad message, learning about the product. Thus, they converted at a higher rate after clicking the video ads.